After reading about the pedals, Classic mostly but also the BHM version, I got in contact with Steve Webster to get, at least, a Classic to try out. After a short wait I received both the Classic and the BHM version of V-stack. As the name suggests these pedal are supposed to be virtual stacks, the Classic emulates the Marshall sound while the BHM is designed to replicate the sound a well known British guitar king (or Queen ;-) ) gets with a treble booster and AC-30 amps. I first tried the classic with a Plexi style amp, Germino lead 55, and it worked very well indeed, like a natural extension of the amp, very cool boost, overdrive and distortion could be dialed in - Coool. It took a few minutes to dial in a good sound with the pedal, if you are not careful with the Cut control the treble can cut of you're head. The V-stack has Bass, cut, gain and a volume control, the circuit includes a treble booster and an analog simulation of a Marshall style amp. The cut controls cut of the treble boost effect; with a bit of tweaking I found some VERY good sounds. Then we plugged in the BHM, all persons in the room started to smile, a Tele through a Marshall style amp sounded very much like the sound you hear on all those queen records, great fun indeed. Later I tried both the Classis and the BHM as direct recoding tool and it is, to my ears, the best simulators I have heard. Not as flexible, of course, as a POD or something like that, but I found a great range of good sound from almost clean to a large amount if dirt. With a bit of room ambience and echo in the mix it sounds very good. 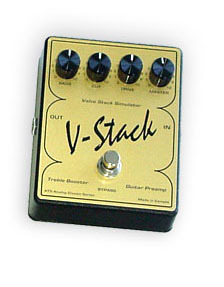 The V-stack also responds very amp like the changes of the guitars volume and tone as well as picking style. The last test was with my Skrydstrup amp, this amp is a Dumble inspired amp with a Fender like clean and a Dumble inspired smooth overdrive. With the V-stack classic the Fender style clean turned into Plexi style dirt, close enough for me to no longer feel that I "need" a plexi style amp, and probably close enough to fool most letners as well. The Dumble style lead sound with V-stack classic added got my into classic Van Halen style tones. A GREAT two-channel amp turned into a great four-channel amp thanks to the V-stack. I also tried the BHM version through the Skrydstrup, this pedal has more gain than the classic and also a very typical midrange sound. Again I managed to get a few very Queen like tones but I also got close to Slash sound on the first two Guns'n' Roses album. With even more tweaking I achieved the type of smooth lead sound that John Jorgensen got with a Matchless on The Hellacasters albums. So to some things up, the Classic is exactly what I was looking for, good enough directs sound and great tones when used with an amp. The BHM is not as flexible to use but if you are after THAT sound just plug in and smile. The Classic might not sound EXACTLY as a "real" Plexi or Marshall style amp, but it's so good that I'm satisfied. You should be aware the you need to be careful how you dial in the pedals if you use them as distortion or overdrive pedals with an other amp. But after some tweaking I got great sounds with quite a few different amps, for me it's a great bonus that they work so well for direct recording or into a mixer for live use, good enough to make me see it as a backup in case my amp fails. The V-Stack actually started out as a casual project to interface my guitars to my PC soundcard, so that I could try my hand at some digital recording. Some of the approaches I used in the design are new, and some I have developed over 30 years of recreational guitar playing and effects building. Part of the inspiration in coming up with the architecture of a treble booster driving into an all-valve stack simulator goes back almost thirty years to one evening when I got the chance to plug my first pedal design into a boosted Marshall 50W stack. That experience left quite an impression on me, and I had been looking for an opportunity to reproduce that sound ever since. I designed that first pedal in 1973 when I was 16 and had just started playing as a hobby. At that time I had been very active in electronics as a hobby since I was 9, but as yet had no formal education in electronics design. When I designed the V-Stack in 2003, I had 26 years professional electronics design experience to draw upon, plus a CAD capability I wouldn't even have dreamed of when I was 16. For the last twenty years I have been designing analog integrated circuits, or microchips, and that's one of the factors that influenced met to take the rather unusual step of basing the design of the pedal on a custom microchip. While it's true to say that microchips have largely replaced discrete transistors in electronic equipment over the years, not many people appreciate that microchip designers, and particularly analog microchip designers, still design circuits at the transistor level. You may not be able to see them any more, but typically there are many more transistors in any given piece of equipment these days. For example, there were 6 discrete transistors in my first pedal design, and there are over 200 transistors in the V-Stack. I did actually build an early prototype using a combination of discrete transistors and op-amps to test the basic approach, but wasn't happy with the unwanted distortion artifacts contributed by the op-amps. That experience finally convinced me to opt for a custom chip design. The photograph shows my first pedal, which I assembled in a biscuit tin in 1973, alongside a V-Stack Classic built in 2003. The AC7303 custom chip was named in recognition of the 30 years of evolution represented by these two designs, although the design of the chip itself is flexible enough to have potential applications beyond its first use as the core processing engine of the V-Stack. There will most likely be new designs based on the AC7303 chip in the future. As far as variations of the present pedal designs, there have been a number of good ideas and suggestions put forward, some more ambitious than others. For the short term, I've seen a few comments from people who would like to see a power jack, and/or LED added, and I understand the requirement. The original V-Stack concept was for a highly portable battery powered unit, and this is why there is no power jack or LED on these first product offerings. To put this in perspective, a LED running at 10mA would cut the battery life in active mode by a factor of more than 10. Having said that, I am presently looking at the feasibility of adding such pedal board friendly options in the future.